Every year I look forward to scouring the web for my favorite champagne and jewelry-related gifts. Feel free to get some inspiration from previous years here. There’s a lot more gift ideas out there than your typical champagne flutes. I always include the Chandon holiday bottle, and this year is no different. The 2016 bottle was actually designed by Rebecca Minkoff! It includes her signature gold stud pattern, and comes in a black or white bottle. Another fun and totally unique gift idea is this sparkling wine making kit from Brooklyn Brew Shop. How insanely genius is this?! This would be perfect for that person in your life who likes something more hands on. This would also be a perfect activity for a couple or a girl’s night in. These adorable Rosanna trays would make for a gorgeous catch-all for keys, change, etc. I think at this point we’re all familiar with the Sugarfina champagne gummy bears! I’ve never actually tried these, but every time I see a picture of them I start salivating. Plus, this is such a hassle-free gift and would be very easy to ship. 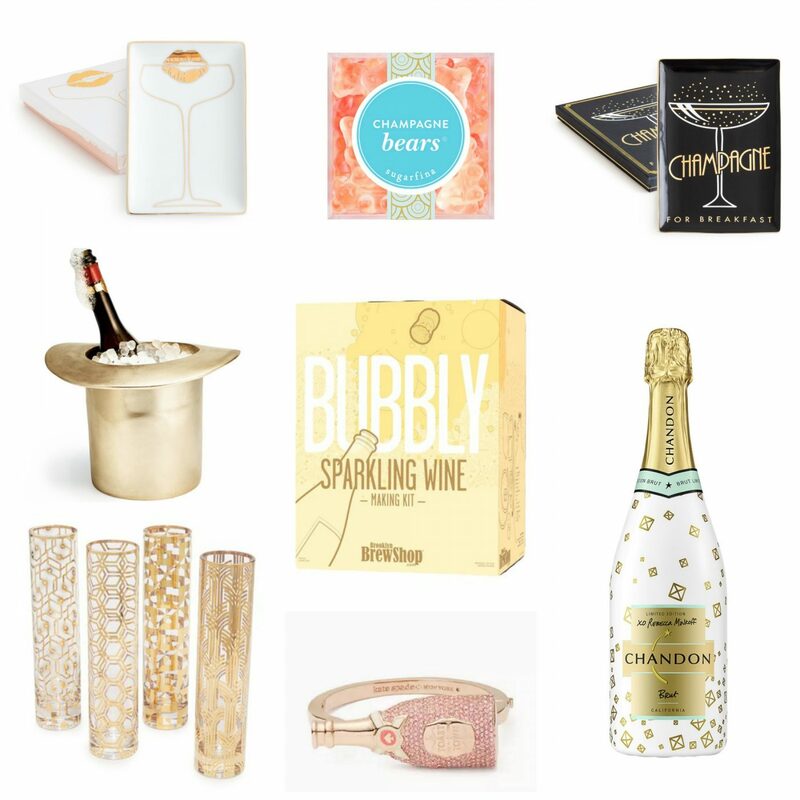 Of course, I had to include something from Kate Spade in my champagne gift guide. They always nail it with their cheeky champagne pieces. I love this rose gold champagne bottle bangle! This is a very small sampling of all the champagne-related ideas I came across this year, but I had to narrow it down somewhere. When I started looking looking for gift ideas, I didn’t even realize a few hours had passed because I was having so much fun. It was also great practice in the art of self-control! Such a great idea for a gift guide! Everyone knows someone who loves champagne. I don’t know how I missed this most but I am highly annoyed that I did! These are the most delicious and adorable ways to have champagne!